Monday January 11th 1926 The forenoon soon gone. I went down to the city early. Most of afternoon in Dr office. Then to 1626 1/2. I had a letter from Hattie, Will Work, a delayed one from Ott. A note from Roxie Robaneau and the letters returned. I wrote Jim Dunlap and Bell Murry. Supper in town. Tuesday January 12th 1926 I got as early a start as possible and went to The City and out to Abernathys. Found the girls at home. Got home before Ott did. Letter from Aunt Emma. Wednesday January 13th 1926 I took an early start to the city and out to Santa Monica to see The Robaneus. A nice visit. Came back to Dr Emerys and on up to 1626 1/2 W 7th. Had a long letter from Lydia. Maime came for us. 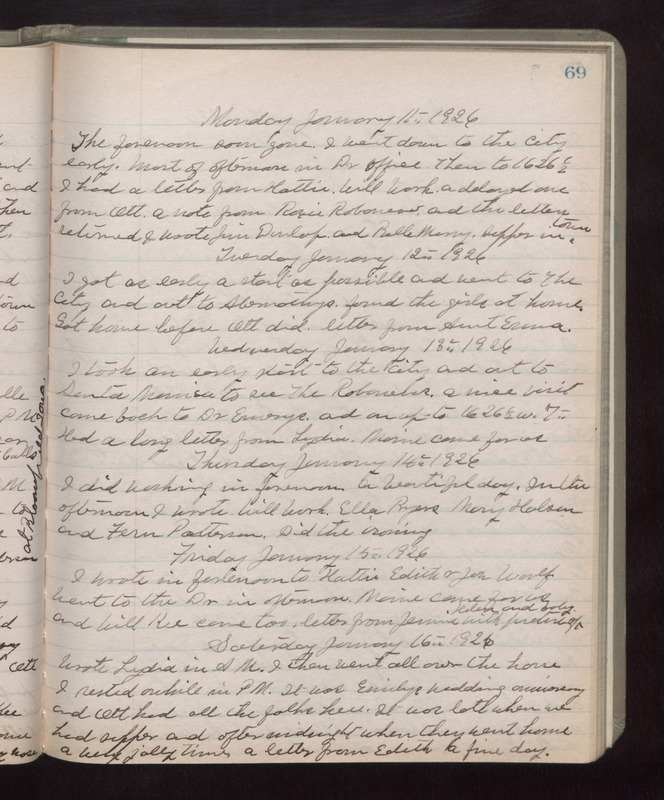 Thursday January 14th 1926 I did washing in forenoon. A beautiful day. In the afternoon I wrote Will Work, Ella Byers, Mary Holson and Fern Patterson. Did the ironing. Friday January 15th 1926 I wrote in forenoon to Hattie, Edith & Jen Woolf. Went to the Dr in afternoon. Maime came for us and Will Kee came too. Letter from Jennie with picture of Helen and baby. Saturday January 16th 1926 Wrote Lydia in AM. I then went all over the house. I rested awhile in PM. It was Emilys wedding anniversary and Ott had all the folks here. It was late when we had supper and after midnight when they went home. A very jolly time. A letter from Edith. A fine day.